Tokidoki designer Simone Legno recently launched the new Tokidoki Barbie Doll. 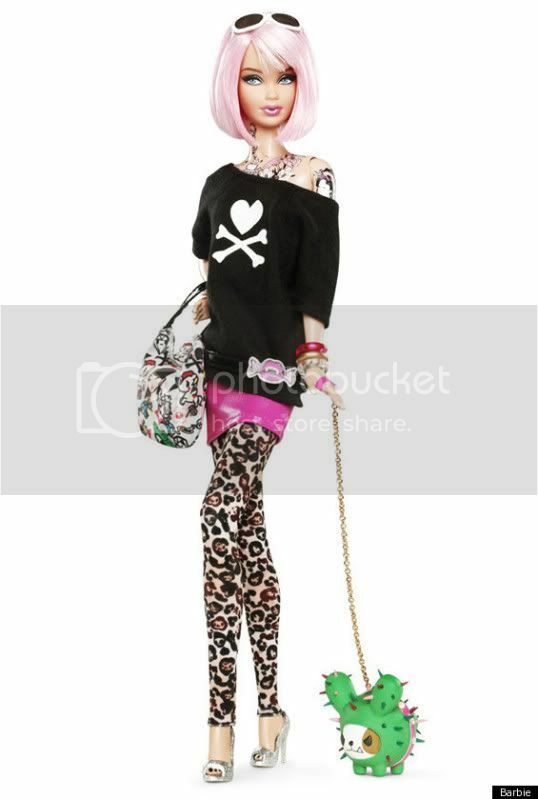 The pink-haired Barbie features Tokidoki tattoos along the arm and neck, pink miniskirt with leopard print leggings, black top with the skull heart & bones, a bag with the brand and Bastardino as her little pet. tokidoki® Barbie® doll is always ready for cutting-edge fashion! This funky fashionista features trendy tattoos and a pink bob. With cactus friend, Bastardino, by her side, she’s ready for fun in fashion-forward form! The doll retails for $50 and has already been sold out! I'm a big Tokidoki fan and I think it's cute, but it is more geared towards adult collectors rather than young kids. You won't see it selling at toy stores like Toys-R-Us, but it is available at www.barbiecollector.com. So far it has sparked some controversy and outraged by some parents. Is the Tokidoki Barbie a bad influence? What do you think? really love the tokidoki/barbie collabo. personally, i think that the barbie doll is more of a collector's item than a toy. i agree with emmanuel! this tokidoki collab is such a success!